Camp comes to a close ..
Last walk up with a friend .. It has been one of the hottest June’s on record here in Wisconsin and this week at camp, the girls .. most of them anyway .. didn’t seem to mind. Other than one day. They rode in the morning and went to the pool in the afternoon. We laughed a little about it, especially since we were at that point, sitting in the air conditioned car. I looked at the temperature gauge. 99 degrees. According to the car. Hugs, introducing parents and taking last day pics ..
Our 11-year-old absolutely loves this camp .. Showing families all they’ve learned .. This is only our second year of overnight .. but she’s been fortunate to come for years to the day camp. There is something about it. The place. The people. The other girls. Learning something new. Being close to home but not too close to start to really learn to feel more comfortable in her independence. Perhaps most importantly, it’s just camp. Late night chats. Secret stories. Running around like crazy. 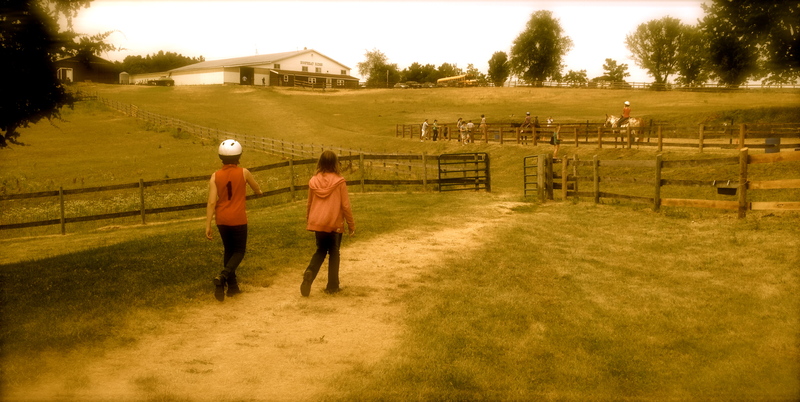 Freedom of being a kid in a cool place and confidence building in life and social skills. That experience she’ll remember for a lifetime. That she’ll perhaps tell her own daughter about. One last ride for this year anyway, on Quincy ..
She gave a few hugs. Said many thank you’s. Bought the standard camp sweatshirt. Grabbed a Gatorade and we hit the road. Ran errands. Then having had enough of the heat all week, grabbed the dog and headed for the River to cool off. While she has a few other camps coming up yet this summer, ones that I know she will love in very different ways ..
She hugged me tighter and said thanks.